If you have ever visited the Chesapeake Bay Wine Region, you know it is flat. Well, there are a couple of small rises, but no real hills to speak of. It can also get quite hot. So you might think that these are inhospitable conditions for viticulture. The ocean breeze, however, helps moderate the temperatures. The coastal air flow also helps decrease the threat of frost. The soil around the Chesapeake contains higher percentages of sand and crushed shell, which allows excess moisture to drain away from vines. These same conditions can provide a degree of minerality in some of the region’s wines. So there are mitigating factors that allow very good wine to be produced in Virginia's eastern, maritime districts. Last weekend I drove out to Caret Cellars, which is the newest winery in the bay area. 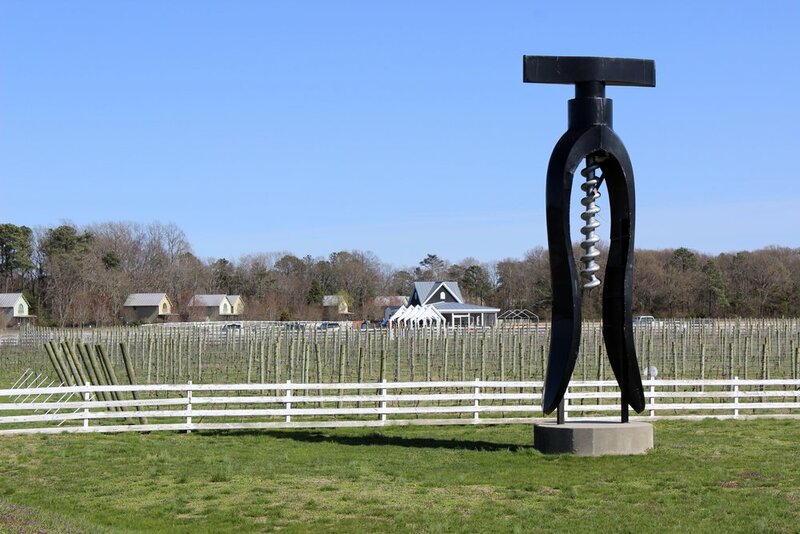 The vineyards are not far from the Rappahannock River and just a few miles northwest of the Route 360 Bridge that crosses the river in the town of Tappahannock. I followed the gravel road past the vineyards and parked in the field in front of the small, wood-frame building that houses the tasting room and at least part of the winemaking operation. The scale of the Caret Cellars operation is relatively small. They are currently cranking out about 600 cases per year, but their sights are set on 2000 cases. The plan is to add 10 or 15 acres to the 6.5 that are currently under vine. The existing vines were planted ten years ago, but owner R.D. Thompson sold his fruit until 2014 when the first bottles began to bear the Caret Cellars label. Floyd Oslin is the winemaker at Caret. He grew up in Pennsylvania’s Lehigh Valley, where he started making wine with his grandfather at the tender age of fifteen. In 1984 Floyd moved to the Chesapeake region with the intention of making wine. He learned commercial winemaking at Ingleside Vineyards, which is one the oldest and most respected wineries in the state. He remained there for years and eventually started consulting for other producers until he finally ended up at Caret. So Floyd has extensive regional knowledge and it seems to be paying dividends. When I entered the tasting room, Floyd was pouring for a small group of tasters. When a spot opened at the bar, I bellied up and tasted ten of the Caret Cellars wines. Floyd stepped me through the offerings, while simultaneously regaling me facts about the winery and the larger wine region. It was a great conversation and Floyd just seemed to love public interaction, which makes him a perfect point person for the winery. I started off with a very nice stainless steel Chardonnay, a Traminette and an exceptional Viognier/Chardonnay blend that has not yet been released. The Chardonnay added bit of crispness that is typically absent from Viognier, making it a much better food wine. There was also a lovely, peach-colored Sangiovese Rosato with raspberry notes that flowed across the palate and gave way to a candy apple finish. The reds started off with a Chambourcin blended with just enough Niagara to make it a crowd pleaser. We moved on to a Sangiovese and then a “Super Tuscan” blend of Sangiovese, Cabernet Sauvignon and Merlot. Wow! I would describe it as light to medium bodied, but with more than enough complexity to hold my attention and structured tannins in the finish. It was my favorite of the regular tasting, but Floyd offered me a barrel tasting of his 2015 Merlot, which I tasted alongside the 2014. Let me just say that 15 was full bodied with a lot of fruit, firm tannins and a crazy long finish. It is a potential medal winner and it should be released by this time next year. I know that this winery is a little out of the way for most of my readers, but Caret Cellars is more than worthy of support. Consider visiting during the Chesapeake Bay Wine Trail Oyster Crawl the second weekend in November. 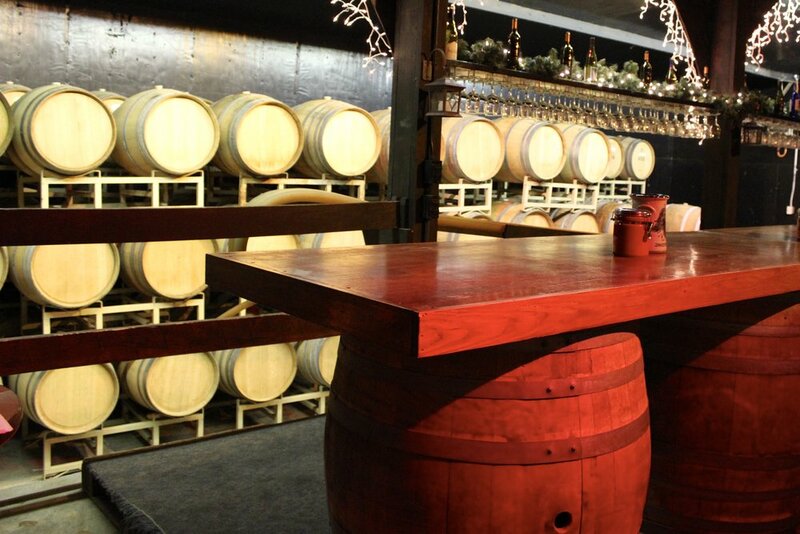 Eat your way through a few of the regional wineries and find out what they are pouring. Whatever you do, however, make the effort to find out more about this winery. When you do, let me know what you think. At the end of his career in the Marine Corps, Major General Richard (Rick) Phillips was looking for a meaningful retirement project. The initial plan was to start a boys' school. Toward that end, he purchased one hundred acres on Virginia’s Northern Neck. As things turned out, however, the backer passed away and his heirs had no interest in a boys' school. So the General needed another project and a new purpose for his for his property. A chance conversation with a member of the Flemer Family (the Flemers own Ingleside Vineyards) convinced the General that viticulture was a viable option. The Flemers were looking for additional sources of fruit and they offered to purchase from the General. So problem solved. In 2002, thirty acres were planted at what became known as General’s Ridge Vineyard. Today the General prefers to be addressed as Rick and by the time I met him, he seemed completely immersed in the business of wine growing. Thirty acres under vine was more than even Ingleside could absorb, so for the next several years, Rick set about finding other markets. Then in 2010, General’s Ridge took the next logical step and began to produce wines under their own label. Seventy five percent of the grapes are still sold to other wineries, but that leaves more than enough. Michael Shaps was brought in as the winemaker and as of this writing, General’s Ridge is producing about 3000 cases of wine per year. On the day of my visit, nine wines were presented for tasting. They ranged from sweet to dry, so they really offered something for every palate. There were three among that lineup that really stood out for me. The Viognier was well crafted with the typical peach notes, but also an array of tropical fruit and a nice finish. The Cab Franc had lots of black fruit, soft tannins and the signature pepper in the finish. It was quite exceptional, but the Petit Verdot was off the charts. The PV was medium bodied with cassis and black cherry on the nose and palate. There were nice structured tannins and a beautiful finish. It needs more time in the bottle, but give it a few more years and look out. Morgan was my wine steward and I thought she was fabulous. She teaches school most of the year and then, in her off time, she educates visitors at General’s Ridge. She really new the wines and brought a nice informal touch to the tasting. We had a very nice conversation that blended nicely with the wine. An informed tasting room staff is important to the entire experience and Morgan certainly represented her industry very well. 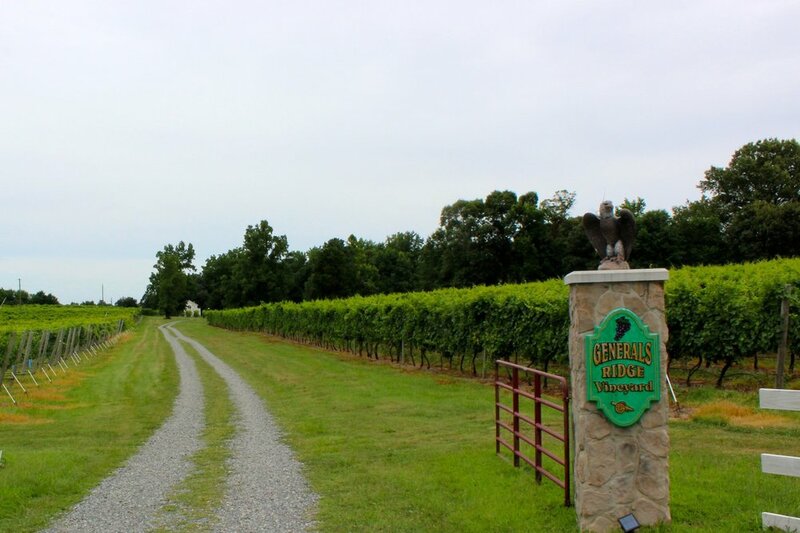 So General's Ridge Vineyard is one of nine wineries on the Chesapeake Wine Trail. A Wine Trail Passport can be obtained at any of the participating wineries. It contains information about the region and instructions on how to earn winery discounts. It represents one strategy for touring the Northern Neck. When you start your tour, General’s Ridge should definitely be one of your stops. 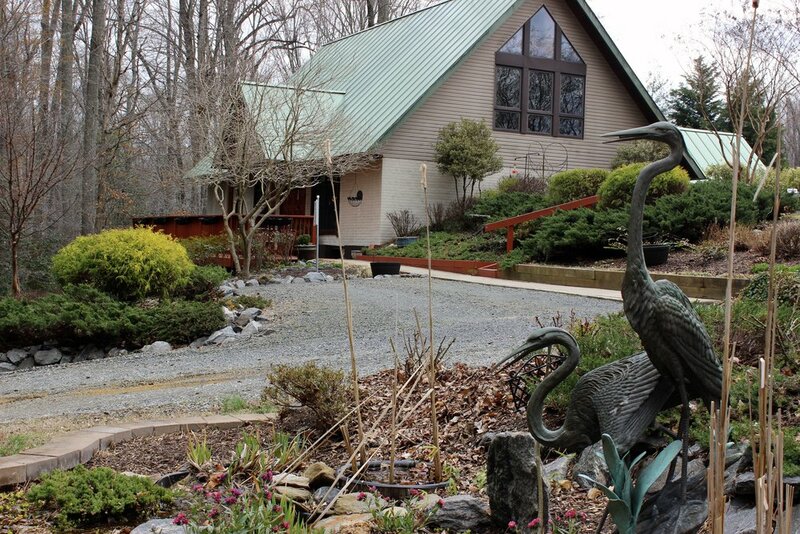 It was Easter weekend of 2015 and I was out on Virginia's Northern Neck visiting wineries. The Northern Neck AVA is a peninsular land mass bordered by the Potomac River in the north, the Rappahannock in the south and the Chesapeake Bay on the southeaster end. I knew very little about most of the wineries in this region, so I had no preconceptions as I parked my car in the Good Luck Cellars lot. There was a very nice Saturday-afternoon crowd, which is always a good sign. Visitors were lounging on the wrap-around deck and playing games on the lawn. Inside there was nice fire going and a small group was surveying the large event space to the rear of the tasting room. There was no wait at the tasting bar. I was able to belly up and join in a tasting with a young couple, who had also just arrived. The eleven wines being poured were made from a combination of vinifera and hybrids. They are growing Cabernet Sauvignon, Cabernet Franc, Chardonnay and Viognier as well as Norton, Chambourcin, Chardonel and Traminette. Good Luck has a total of twenty two acres under vine and grow a twelve different varietals. So I was anxious to see what they were doing with these grapes. The white wines were uniformly excellent. They included a very nice Chardonnay and a Vignoles, which is a French hybrid. The Vidal Blanc took bonze in the Governor’s Cup and was among my favorites. Its fruit and crisp acidity made it a standout, but I think the Chardonel stole the show. This Seyval Blanc/Chardonnay clone was a dry-style wine that showed big citrus notes, balance and a very smooth finish. Among the reds I noted most of the wines being poured on that day were Chambourcin. They were all well made, but I particularly enjoyed the 2010 Cabernet Sauvignon. It was big and slightly jammy with nice berry and cherry notes. I was also able to sample some unreleased vintages, but I’ll talk more about that in a bit. Following the tasting, I had an opportunity to sit down with Paul Kropp, who is the owner and winemaker. His degree in organic chemistry translated well into winemaking. He has, however, had some additional guidance during his learning curve. Bill Swain originally consulted for Good Luck and more recently Tom Payette has filled in. Paul is currently producing about 3000 cases of wine and it is possible that this will increase to as much as 5000 cases, but that is probably the limit. The entire Kropp family was visiting that weekend, so Paul gathered them up and led all of us down into the winery. He conducted a brief tour of his production area and barrel room, then led us into a corner that appears to function as a small lab. Paul opened a couple of his yet-to-be-released 2013 reds and poured a generous tasting. We sampled his Cabernet Sauvignon and the Inheritage, which is a Bordeaux blend. I should point out that the first grapes were planted in 2005 and the first vintage was bottled in 2010, so Paul only has a few years of winemaking under his belt. He did some hobby winemaking, but that is quite different from commercial production. I thought the 2010 Cab Sauv was good, but the 2013 was excellent and the same can be said for the Inheritage. He hit these out of the park. Both were big, complex reds with a lot of aging potential. So Paul nailed it with his fourth vintage and I think this bodes well for the future of Good Luck wines. It is still a young operation, but Good Luck Cellars may be trending toward the top tier of Virginia wineries. This one should be on our watch list and it is one of my top recommendations on the Northern Neck. If you want to see what is possible in this region, I strongly recommend a visit. After you stop in, I really do want to know what you think. There are a handful of wineries that have been around since the early days of Virginia wine production. Those that remain are spread fairly evenly around the state. Ingleside Vineyards is among them and the only one in the Northern Neck American Viticultural Area. Just sticking around for thirty-five years does not necessarily convey any additional special status on a winery. Even old-growth vines are not a sure indicator of excellence. Ingleside, however, has done far more than survive. The Flemer family continued to grow the business and established a reputation as one of the Commonwealth’s premier wineries. What is more, they did this in an area that is not widely recognized for great wine. On top of that, they were also instrumental in nurturing the wine industry on the Northern Neck. Indeed, many of those wineries might not exist, if not for assistance, advice and encouragement of the Flemers. Ingleside currently has fifty of their 132 acres under vine and a total of twenty-one varietals are cultivated. I am not sure of the previous production levels, but I am told that production was reduced to 12,000 cases in order to focus on quality. Based on the wine list it appears that all of the estate fruit is vinifera and they are primarily growing grapes that are common throughout Virginia. There were, however, a few surprises like Pinot Grigio, Albarino and Sangiovese. A couple years ago, the Flemers brought in a winemaker with a serious Virginia pedigree. Dominick Fioresi learned his craft as part of the apprenticeship program at Linden Vineyards. This is significant, because arguably some of the best wineries in the state are products of that program. Dominick’s terroir-based attitude is evident in his wines, which are consistently winning awards. It is still too early for his reds to medal, but his 2014 Albariño took gold in the Governor’s Cup and his Viognier earned bronze. I was able to get and early sample of a couple of the reds and I can say they will be well received following release. I tasted six wines from the premium tasting list, plus a couple that Dominick brought out. The Albariño was definitely worthy of gold. I am typically disappointed with Virginia examples of this grape, but I found it reminiscent of the wines of Rias Baixas. It was fabulous. The Chardonnay Reserve was another standout and the Virginia Gold blend was absolutely killer, but I want to tell you about the 2013 Cabernet Franc. It has not yet been released, but Dominick poured me a generous dollop without revealing what I was tasting. I am a huge fan of Cab Franc. It is easily my favorite Virginia varietal, but I simply could not identify it. It lacked most of the typical characteristics. It was much bigger and had more of a Cabernet Sauvignon profile. All I can tell you is that it is one of the best and most interesting Cab Francs I have tasted… from anywhere. My hat goes off to the winemaker. I must say that everything about Ingleside is first rate. Kerri and Jennifer were behind the tasting bar when I arrived. Both were knowledgable and engaged. Jennifer poured my wine, while both she and Kerri filled in all the details about the winery. Every aspect of my visit reinforced my image of Ingleside as one of the state’s premier wineries and the quality of my experience seemed to be shared by the other visitors. There are many reasons to visit Virginia’s Northern Neck. When you intend to visit that part of the state and if you are going to visit only one winery, this should be the one. 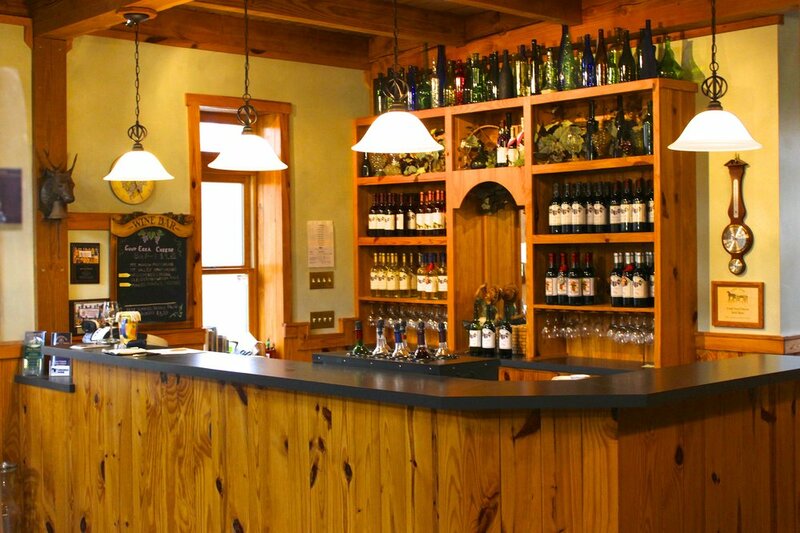 The wine is some of the best you will find in the Commonwealth and everything else about the winery is top notch. After you stop in, let me know what you think. Northern Neck George Washington Birthplace American Viticultural Area (AVA) is a mouthful to repeat. By way of abbreviation, I usually shorten it to “The Northern Neck.” In any case it is one of Virginia’s seven AVAs. 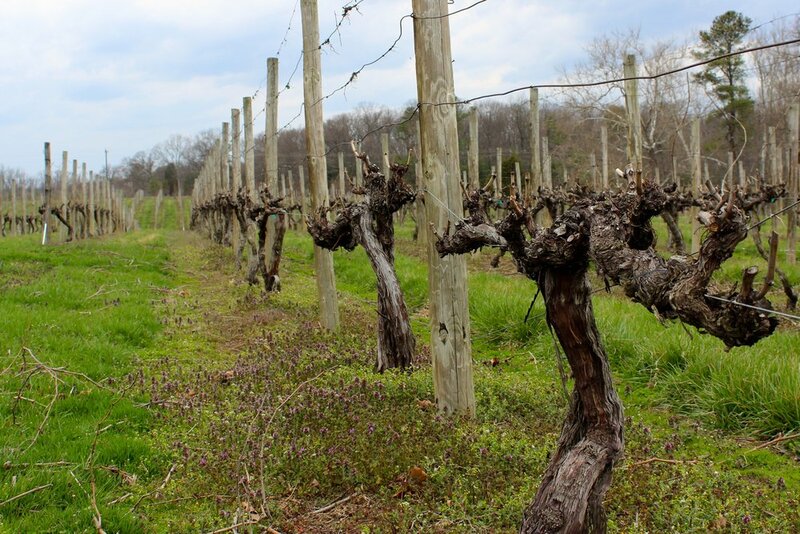 There are currently ten wineries operating in the AVA, which is part of the larger Chesapeake Bay Region. One of these is Jacey Vineyards. Jacey is at the southeastern end of the Northern Neck, where Dr. Robert Jacey started planting vines back in 2004. As of this writing, there are seven acres of vines and suitable acreage to increase to a total of twelve. The estate fruit includes common Virginia varietals like Petit Vert, Cabernet Sauvignon, Norton and Vidal Blanc. There are a few lesser-grown grapes as well. Wines are also being crafted from estate Malbec, Zinfandel and Sauvignon Blanc. The dampness of this coastal region is a challenge. High-quality fruit requires a diligent spraying schedule. Dr. Jacey is both owner and winemaker at Jacey Vineyards. He learned the winemaking craft from his friend Geoffrey Cooper of Cooper Winery in Central Virginia. He began making wine in 2007 and uses primarily grapes grown on the property. Despite any challenges, this small boutique winery manages to produce a few exciting wines. I tasted five of the Jacey wines and I found them all to be well crafted. I was surprised to find that the Zinfandel had a little residual sugar, which made it a bit sweeter than one might expect. It is not a Californian Zin and doesn’t try to be. It is a good “gateway” red, that may appeal to new wine drinkers or those that have not yet discovered the wonders of red wine. The real standout of this tasting was the single-varietal Sauvignon Blanc. Its bright acidity really complemented the citrus and mellon notes. It is a fabulous wine for pairing with local seafood or just for drinking on a hot Virginia day. I arrived a few minutes ahead of opening and I was unannounced, which is never good. On top of that, a new wine steward was being trained and there were a lot of questions. In spite of this, I thought that David did a great job. He was forthcoming and did not pretend that he had all the answers. Most importantly, he was attentive and engaging. All things considered, it was a great visit and I can absolutely recommend this winery as a stop on your Northern Neck tour. After your visit, let me know what you think. Conrad Brandtz comes from a German winemaking family, but he was a generation removed from that tradition. Nevertheless, shortly after college, something in his genetic makeup got him started making wine as a hobby. I hear this story all the time about a hobby becoming a commercial venture. Conrad and his wife Dorothy planted their first vines in 1986 and sold his fruit while pursuing his hobby with his own grapes. Conrad went on to take classes at Ingleside, which is one of the oldest Virginia wineries. It was 1999 before they took the next step and got their farm winery license. Then in 2003 they opened a tasting room and began pouring the Oak Crest Vineyard wines. Today Conrad and Dorothy have eight acres under vine and produce between 1200 and 1800 cases of wine annually. They are making about a dozen different wines from exclusively estate fruit. Among these you will find many of the typical Virginia varietals, but there is one surprise in the lineup. They are growing Symphony, which is a Muscat-Garnacha clone developed at U.C. Davis. It can produce wines that range from dry to sweet. I am always a sucker for something new, so I was excited to get on with the tasting. The only white grape grown at Oak Crest is the Symphony and they are producing both dry and sweet examples. The Moonlight Sonata is done in a “Rhine” style and is the driest at two percent residual sugar. This is just enough sugar to be detectible, but I found it to be fruity, dry and balanced. The tiny bit of sweetness perfectly complimented the acidity to make a wine appropriate for food or just for drinking. My favorite of the tasting, however, was the Cabernet Sauvignon. It is blended with a bit of Merlot and Cabernet Franc. It has a beautiful nose, a lot of red fruit and round tannins. It was drinking well. I found the tasting room to be beautifully laid out with ample seating and a cozy little fireplace in one corner. The tasting was expertly performed and the wine steward was both knowledgable and engaging. I enjoyed my visit and walked away feeling like I had learned something about the wine and the winery. It was very well done and I felt that Oak Crest was an excellent representative of the Virginia wine industry. 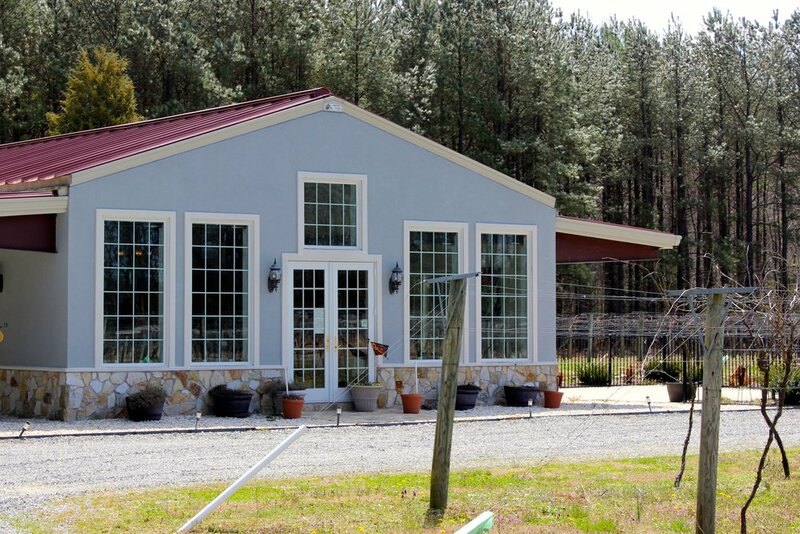 Oak Crest is certainly one of the better wineries on the Northern Neck. A visit to this part of the state will not be complete without stopping in and they are definitely worthy of our support. So if you find yourself in King George County, check them out. The venue and the wine are all the reason you need. After your visit, let me know what you think. White Fences Vineyard and Winery once produced wine on the southeastern tip of Virginia’s Northern Neck just outside the town of Irvington. The winery was placed on the market. Mike Hollingsworth took interest, noted that the light, sandy soil had real potential for viticulture and subsequently made the purchase. 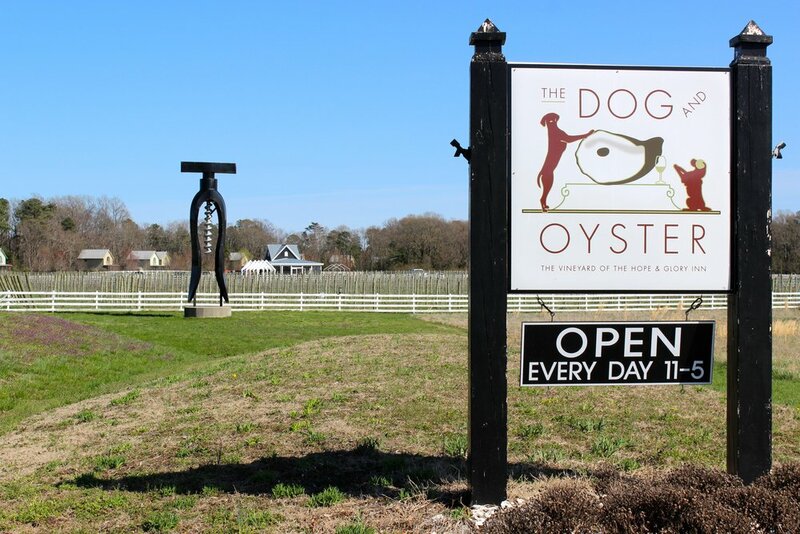 With the change in ownership came a change of name and in 2011 The Dog and Oyster Winery was born. The vineyard is named after the rescue dogs that live in the vineyard and protect the vines from predation. Well, that’s the “dog” part anyway. The winery also serves oysters and guests are asked to leave a message of their choice on one of the oyster shells that adorn the tables. So there you go. The vineyard was planted back in 2003 and today there are six acres under vine. This allows Dog and Oyster to produce between 1000 and 1200 cases of wine annually from four varietals. Chambourcin, Merlot, Chardonel and Vidal Blanc are the single varietal wines on the tasting menu. Sadly, the Vidal Blanc was struck by Pierces Disease and will be replaced by Petit Manseng. The lineup of wines was quite good. I particularly liked the Vidal Blanc with its tropical notes and minerality. The Chambourcin, however, was the real standout. It is a dark, garnet wine with cocoa notes and a lot of red fruit. It is definitely in the top tier of Virginia Chambourcins. It, along with all the other wines on the menu, won bronze in the Governor’s Cup. This is an indication that they are doing something right in the vineyard and the winery. Dog and Oyster has ample seating both indoors and out. The staff was friendly and attentive and a nice crowd filtered in and out during my stay. It is a nice place to relax on a warm Chesapeake day and look out across the vineyard, while sipping a glass of wine. I recommend checking them out. After stopping in, I would love to know what you think. Virginia’s Northern Neck is a peninsula that is bounded on the north by the Potomac River, the south by the Rappahannock River and at it’s very tip, it meets the Chesapeake Bay. It’s full of colonial and post-colonial history. George Washington’s birthplace is out on the “Neck.” President Monroe was from the area as was Francis Lightfoot Lee, signer of the Declaration of the Independence. In the pre-Civil War era the peninsula was home to numerous large tobacco plantations. 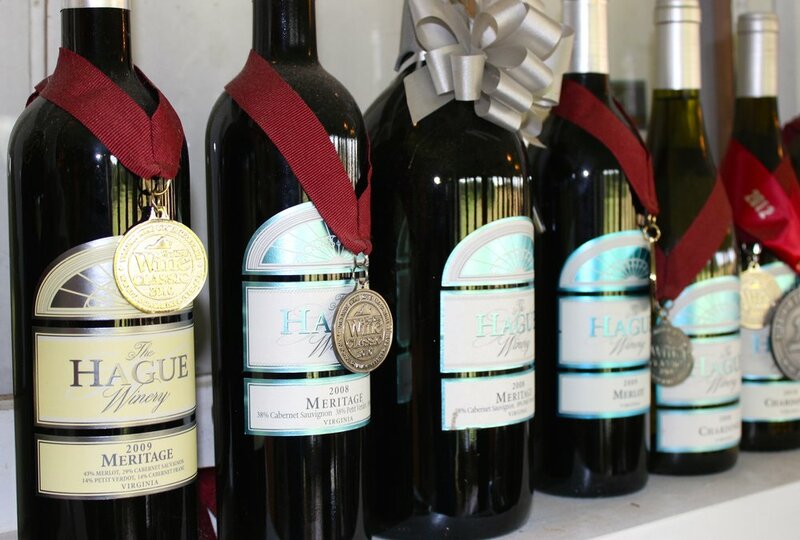 The Hague Winery sits today on property that was once part of the Buena Vista Plantation. 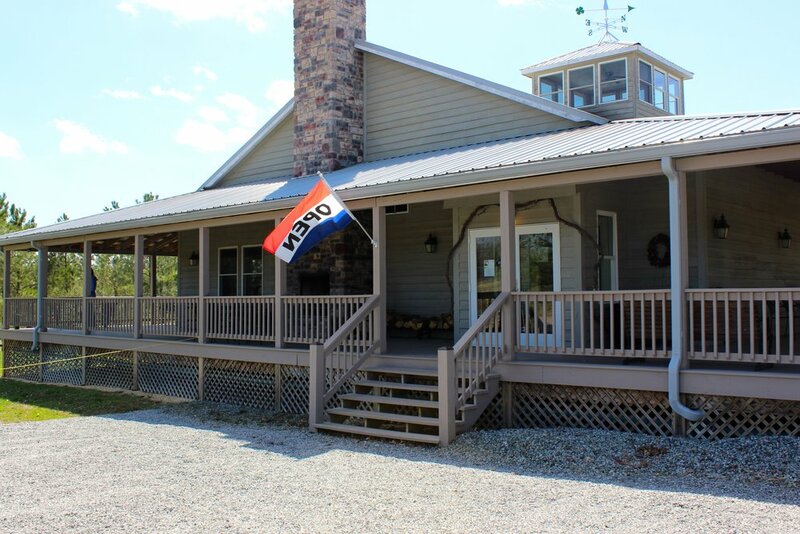 Steve and Cynthia Madey purchased the property following Steve's career as a naval aviator and planted the first vines in 2004. After selling his first harvest in 2007, Steve received such praise for the quality of his grapes that he decided to take the next step. Michael Shaps was brought in to make the wine and in 2008 The Hague produced its first vintage. Today five varietals are grown on the property: Chardonel (a hybrid developed at Cornel, that is a cross between Chardonnay an the Seyval), Merlot, Cabernet Franc, Petit Verdot and Muscat. Outside grapes are never purchased. So the roughly 1000 cases produced annually is made exclusively from estate fruit. There were a total of six wines being poured and we started with a pair of Chardonels. the 2011 was blended with a little Petit Manseng which gave it some floral notes. It was a dry, crisp, balanced wine with nice fruit. The 2013 was blended with a bit of Muscat, so it showed a little more fruit, but was also done in a dry style. Both were very well constructed. The reds at The Hague are really the main story. They just built upon one another beginning with a medium-bodied Merlot with lots of red fruit and structured tannins. Then came an excellent Cabernet Franc, with plum, soft tannin and lots of complexity. Then a Meritage Reserve that spent fifteen months in oak. It had leather on the nose, which was followed by cassis and plum notes and closed with a very long finish. The Petit Verdot, which is touted as one of The Hague’s best wines and one that tends to fly off the shelf, was not being poured, so I took one home. I’ll have to tell you about it in a later post. Nancy was working at the wine bar. She has been with the winery for four years and has a wealth of knowledge. Her presentation was filled with information about each of the wines and background on both The Hague and the surrounding area. Several customers cycled through while I was at the bar and I thought she did a great job educating each of them. There’s no substitute for that kind of knowledge and experience in the tasting room. So I had another successful visit at another great winery and it was the first I’d ever visited on “the Neck.” If you happen to be out that way, it’s definitely worth checking out. Historic Vault Field Farm is located not far from the town of Kinsale in Virginia’s Northern Neck AVA (American Viticultural Area). In 2005, Keith and Janne Meenan converted the farm’s production to viticulture, when they planted over six acres of vines. Today Vault Field Vineyards produces roughly ninety percent of the fruit used to produce 1200 cases of wine annually. When I visited, the tasting bar was staffed by Phil, who poured the wine and Freddy the vineyard cat, who was napping and couldn’t be bothered by visitors. Phil explained that the winery concentrates solely on producing the best possible product and toward that end, there appear to be no gimmicks at Vault Field. They don’t do lots of flashy music events and, unlike many of the wineries I visited on the “Neck,” they don’t outsource their winemaking. All of the wine is produced on the property. Kudos to them. I tasted five wines that ranged from off-dry to dry. I will say there were no recent vintages on the menu. The youngest wine was a 2010 and that was a white. The reds were all 2008 and 2009, which were both good years. The 2008 Reserve Red was my favorite of the tasting. It is a Bordeaux blend of Cabernet Sauvignon, Cabernet Franc, Petit Verdot and Merlot. I found that it had a bit of leather on the nose and lots of red fruit notes. It was complex with structured tannins and a very long finish. It is a very well crafted wine. During the tasting, I had an extended conversation with Phil, who has worked in more than one tasting room on the Northern Neck. He seems like just the type of wine steward every winery should employ. His knowledge of the wine and the region was extensive. He was also personable and entertaining. The entire experience was first rate. A tour of Northern Neck wineries must included a visit to Vault Field. They are a member of the Chesapeake Bay Wine Trail and are surrounded by all of the historic early-colonial sites that make the “Neck” a tourist destination. So no excuses, check them out.